Did the Maya Build Fort Mountain Wall? In fact, the name “Chiaha” is actually a Mayan word which means “edge water” or “water’s edge.” The Chiaha built their villages beside the water thus this is a fitting description. The capital of Chiaha was actually built on an island in the middle of a river. Also, the word for “house” in Hitchiti is chikee. The Totonacs of Mexico also use the word chiki for “house.” They borrowed the word from their Maya neighbors where the word means “woven basket.” This is a fitting description for a Miccosukee chikee since they used mats woven from split cane as walls, partitions and privacy screens. 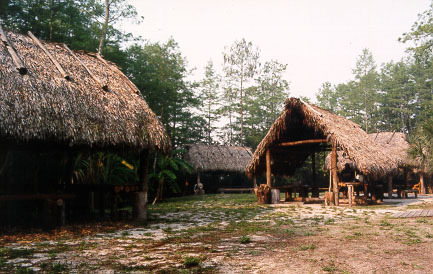 Also, the winter house or “hot house” of the Miccosukee is called a chokofu. 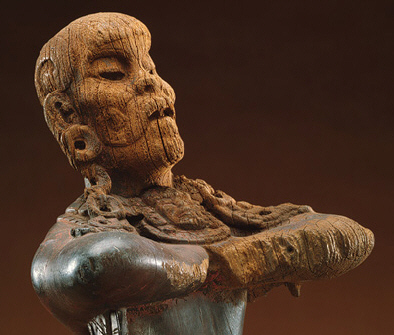 In Mayan, choko means “hot.” Additionally, chi means “mouth” in both Hitchiti and Mayan. These are just a few of the linguistic connections between the Miccosukee/Chiaha and the Maya. The Hitchiti migration legend also suggests a Mesoamerican origin. This legend states that the Hitchiti emerged from “reeds” along the shore. They then walked towards the rising sun until they encountered a large body of water that they first thought was the ocean but quickly discovered was a large lake. They settled here for a while before journeying north where they settled permanently. If we start in Georgia where the Hitchiti were living at the time this migration legend was recorded and follow the legend in reverse this suggests Florida as the place they migrated north from into Georgia. The only lake in Florida big enough to be confused with the ocean is Lake Okeechobee thus it is probable this is where they first settled down after emerging from “reeds.” And since we know humans don’t simply sprout from the ground, it’s safe to assume they arrived in Florida by boat. Coincidentally, it is in the Lake Okeechobee area at a site called Fort Center where we find the earliest evidence of corn agriculture in the southeast. Corn is a native crop of Mexico and researchers have yet to come up with a solid explanation for why corn shows up in south central Florida before it shows up elsewhere in the southeast. The most logical explanation, of course, is that it arrived with people who traveled from Mexico to Florida by boat. Curiously, the Maya referred to any large city as “reeds” or “place of reeds” comparing the vast numbers of people in a city to the vast number of reeds in a marsh. The fact that the Hitchiti migration legend included the seemingly insignificant detail that they emerged from “reeds” suggests the Hitchiti migrated from a large Mayan city. The only people capable of such long distance ocean travel at this time in Mexican history were the Olmecs or their descendants, the Chontal Maya. Both of these groups controlled the coastal trade routes along the Gulf coast of Mexico as far south as Central America. The Chontal Maya, who called themselves the Poton, worshipped a moon goddess named Ix Chel and this lunar cult appears to date back to Olmec times. The Aztecs referred to one location where the Chontal Maya lived as Nacajuca, “place of pale faces,” due to the light skin of the inhabitants. 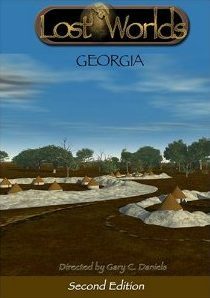 Could the Chontal Maya be the light skinned people who built Fort Mountain according to Cherokee legends? 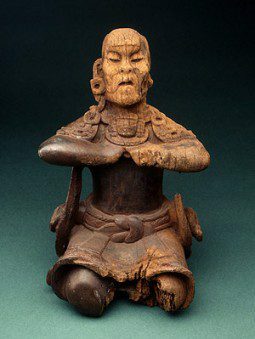 A wooden statue of a Poton Maya lord shows what appears to be a trader with a handlebar mustache, a unique depiction in the Maya world yet consistent with early Spanish accounts of Creek Indians in Georgia with mustaches.